The Earth is around 4500 million years old. That's a fact, and anyone who asserts otherwise simply does not know what he is talking about. The evidence for this as I pointed out yesterday is considerable, and covers a wide range of areas from ice cores to radiometric dating. Despite this, our community is filled with people who in all seriousness believe that the Earth is only 6000 years old, and when shown the evidence which refutes that position persist in maintaining this mistaken belief. As philosopher of science John Wilkins  has noted, psychological and sociological factors arguably play the main role in preserving beliefs as patently false as YEC in closed communities such as ours. I wondered at how a clearly intelligent person could believe what he believed, and then it hit me: he couldn’t speak to outsiders, because they just looked at him with their jaw open and shaking their head. His beliefs isolated him from those outside his community, and therefore, by implication, strengthened his involvement within the community. If you believe silly crap, then the only people you can talk to are those who have the same silly beliefs. It's a cold and lonely world out there, and if your social connections come from a community that is heavily into science denialism, your choice between the loneliness of intellectual honesty or rationalising away uncomfortable facts in order to maintain that social network is often quickly and unconsciously decided in favour of the latter. 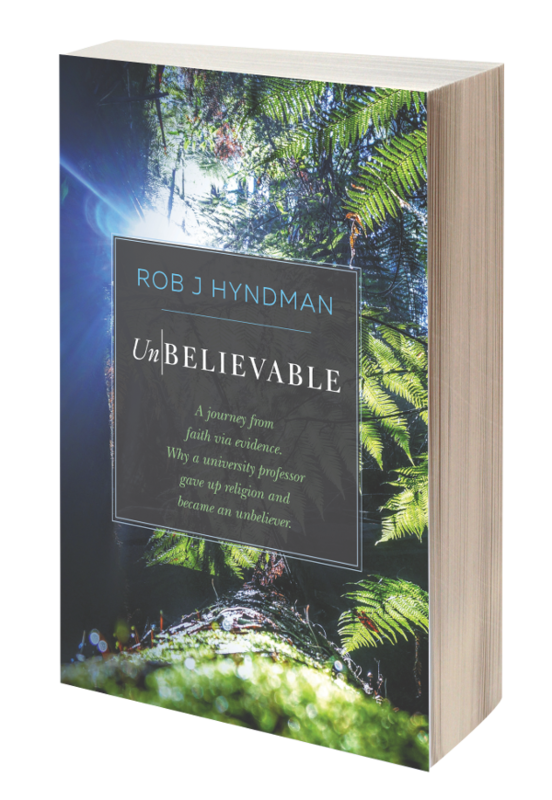 If the YEC / science denialist stance is also linked even implicitly with theological orthodoxy , then there is the added spur of the risk of jeopardising salvation to help the challenged YEC make the unconscious decision to rationalise away the evidence against YEC. The parallels with sections of our community are fairly clear, and need no elaboration. If our community is to escape the YEC delusion, then one way is to show that such views were alien to the original community, and that the shift to YEC came as a result of a disastrous infiltration of fundamentalist nonsense into our community in the mid-20th century  from which we are still suffering. Far from representing a 'capitulation' to 'secular science', these views represented the careful thoughts of a generation that unlike the current generation of YEC science denialists in our community actively engaged with the best of contemporary scholarship, and were therefore well aware of the evidence which even in the 19th and early 20th centuries overwhelmingly confirmed the great antiquity of the Earth. Contemporary YEC science denialists in our community who pompously chide an earlier generation for 'compromising' on the subject of the age of the Earth have themselves done just the same by uncritically accepting evangelical Christian nonsense on the subject of the age of the Earth, or by isolating themselves in a fundamentalist bubble and consulting nothing more authoritative than their own ignorance. Weaning those in our community off the YEC delusion will be difficult, but showing them that at the very least, belief in an old Earth was normative for our community and those that endorse YEC are endorsing an aberrant view that owes everything to the apocalyptic visions of Seventh Day Adventist founder Ellen G White (which found their way into the evangelical community via Whitcomb and Morris' The Genesis Flood and then into ours) and little if anything to the Bible will serve as an excellent beginning. "We do not just acquire our beliefs in one step, but accrue them as we develop into adults. There is a cost to this, and so to move someone from their core beliefs and values, you have to make it something that would outweigh the costs involved in acquiring and maintaining those beliefs." That is our problem as Ex-Christadelphians seeking to deconvert Christadelphians; we can't give them something that will outweigh the emotional costs and pain of abandoning their silly beliefs. We can't offer eternal life and all of the other magical nonsense that they have cemented into their brains as core beliefs. Our message that you only live once and that there is no paranormal god overseeing everything seems to be despair and depression to Christadelphians. They don't share our love of rational, critical thinking. They are not willing to seek real Truth if it does not come sprinkled with magic dust and sugar. They dare not face life outside the sect because they are not mentally strong enough to cope outside the Christadelphian community. Even Ex-Christadelphians who are evicted from the sect find this to be a hugely traumatic experience. Why would any one want to suffer that pain voluntarily? ﻿And so the Christadelphian self-delusion bolstered by Confirmation Bias continues. They call it "the Truth"; but an individual requires an unusually strong love of truth before they realise that the Truth lies outside Christadelphian dogma. 2. 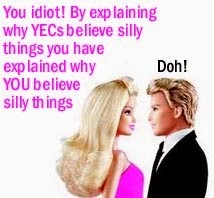 When YECs discuss this subject, not infrequently emotional words such as 'wisdom of man' and 'science falsely so called' are dog-whistle words are used which are calculated to evoke just the right non-rational response.